Department of Chemistry 1, North East Frontier Technical University, West Siang - 791001, Arunachal Pradesh, India. School of Pharmaceutical Management 2, IIHMR University, Jaipur - 302029, Rajasthan India. Imperial Life Sciences Genomics Division 3, Gurugram - 122001, Haryana, India. Faculty of Technical Engineering 4, University of Aleppo, Syria. ABSTRACT: Berberine hydrochloride is an isoquinoline alkaloid isolated in the form of Berberine hydrochloride from the roots and stems of Berberis vulgaris, B. aristata, Coptidis rhizoma and other plant species. Berberine is well known for its antiproliferative and anti inflammatory activity since long time. The present study is carried out to study mechanism of inducing apoptosis by berberine hydrochloride on HEPG2 liver cancer cell line. MTT assay used to study cytotoxicity against HEPG2 cells and COX2, PGE2 and western blot were used to study its apoptotic pathway. PGE2 has been implicated in COX-2-mediated effects; we determined the levels of PGE2 in the berberine-treated cells. Our results revealed that treatment with berberine hydrochloride for 24 h resulted in significant inhibition of PGE2 production in a dose-dependent manner 21-75%, P, 0.01-0.001, suggesting that berberine induced reduction in PGE2 production is associated with an inhibitory effect of the berberine on COX-2 in these cells. Berberine has shown PPAR Gamma activation and COX2 inhibition via PGE2 regulation and caused apoptosis by down regulating anti-apoptotic protein bcl-2 and upregulating bax and bak proteins. From the studies it is concluded that berberine hydrochloride can be a potential chemotherapeutic agent to treat Hepatocellular carcinoma. INTRODUCTION: Berberine is an isoquinoline alkaloid isolated in the form of Berberine hydrochloride from the roots and stems of Berberis vulgaris, B. aristata, Coptidis rhizoma and other plant species. It has diverse pharmacological actions like antidiabetic, antilipid peroxidation, neuro-protective, anti-inflammatory, and antibacterial, antifungal and has been used as a remedy for different diseases for thousands of years in India and China traditional medicines 7. Hepatocellular carcinoma major form of liver cancer is the most prevalent human malignancies in the world. Treatment for liver cancer remains elusive and primary approach to treat is chemotherapy 4. Chemotherapeutic agents induce apoptosis and cause cell death. Apoptosis is programmed cell death, whereas autophagic cell death is simply defined as cell death with autophagy 9, a process that is also thought to be important for cell survival. Recently, extensive studies have reported that apoptosis and autophagy were both involved in chemotherapeutic agent-induced cancer cell death 10, suggesting that apoptosis and autophagy are important target mechanisms for novel therapeutic agents 12. The Akt-PI3K pathway influences many factors involved in apoptosis either by transcription regulation or by direct phosphorylation. AKT promotes expression of pro-survival genes, promotes expression of Caspase inhibitors, c-Myb and Bcl-Xl. AKT directly phospohorylates proapoptotic proteins like Bcl-2 family members. Berberine has shown to induce apoptosis by inhibiting AKT pathway. Berberine induced over expression of GADD153 in human cervical cancer cells, leading to release of Ca2+ from endoplasmic reticulum (ER), and dysfunction of mitochondrial membrane followed by cytochrome c release and caspase-3 activation leading to apoptosis 13, 14. Cyclooxygenase is the enzyme that responsible for inflammation. COX-1 is constitutively expressed and has an important role in cell homeostasis, while COX-2 1, 2, 3 is an inducible enzyme activated by extracellular stimuli. Over expression of COX-2 stimulates the production of prostaglandins, including prostaglandins E2 (PGE2), which are implicated in inflammatory responses and also in carcinogenesis and metastasis. Berberine has shown to lower COX-2 expression in many human cancer cell line studies. Berberine canonically has the potential to modulate Wnt/β-catenin pathway leading to cell death in cancer cell lines treated. Berberine induced apoptosis in prostate cancer cells by direct activation of AMPK (5' adenosine monophosphate-activated protein kinase) and leading to AR (Androgen receptors) 6, 8. The study was designed to determine whether berberine hydrochloride follows PPAR gamma activation and COX2 inhibition by regulating PGE2 (Prostaglandin E2) signalling pathway in dose dependant manner in HEPG2 cancer cell lines. MTT Cell Viability Assay: The MTT method was designed to determine the viability of cells by metabolic activity. Yellow water soluble MTT is metabolically reduced in viable cells to a blue-violet insoluble formazan crystals. The number of viable cells correlates to the colour intensity determined by photometric measurements after dissolving the formazan in DMSO 19. The HEP-G2 cell lines were purchased from National Center for Cell Sciences, Pune. The cell lines were chosen as they have a significant history of use in the anticancer activity assays. Preparation of MTT Solution: Stock concentration of 5 mg/ml MTT was prepared in PBS and sterile filtered with 0.22 µ filter and was used for the study. Preparation of Berberine stock solution Table 1. Stock concentration of berberine chloride was prepared by dissolving the test item in 100% DMSO. From the final stock different concentrations of the final working stocks five concentrations were prepared in DMEM medium by 4 folds and 3 folds serial dilutions as specified in Table 2. Diluted stocks were used for the study. Test System Preparation: Prior to the assay the test system HepG2 cells were propagated at 37 ± 1°C in a gaseous environment of 5 % ± 1% carbon dioxide, in humid environment in tissue culture flasks containing medium, Dulbecco’s Modified Eagle Medium (DMEM) (Invitrogen, USA) supplemented with 10% fetal bovine serum (Invitrogen, USA) and penicillin (100 units) – streptomycin (100 µg) antibiotics (Invitrogen, USA) to obtain the sub confluence of cells (70% to 90% Confluent). Cell Seeding for Cytotoxicity Assessment: Cell monolayer was rinsed with PBS, aspirated off PBS and cells were trypsinized with 0.25% Trypsin with 0.2g/l EDTA in tissue culture flask at 37 ± 1 °C until the cells detached and floated. DMEM with 10% FBS was added into the flask to flush out the cells and centrifuged at 900 rpm for 5 min. Cells were resuspended in DMEM medium and cell suspension was subjected for the cell count and viability to determine cell number per ml. Cell number was adjusted to 2 × 105 cells/ml and 0.1 ml of the adjusted cells were seeded in each well of 96 well cell culture plates. Frequent mixing was done during the seeding, to achieve a uniform cell suspension for plating the cells per well. Plates were designated to indicate its contents and date of experiment. Plates were incubated at 37 ± 1 °C for 24 ± 1 h in gaseous environment of 5% ± 1% carbon dioxide. Treatment: After 24 ± 1 h incubation the cell were exposed to different concentrations of test items (Ref Table 3) by replacing the spent medium with 100µl of different concentrations of the test items solution and incubated for 48 ± 1 h at 37 ± 1 °C in gaseous environment of 5 ± 1% carbon dioxide. Positive, negative control and blank were dispensed in the designated wells and incubated for 48 ±1 h at 37 ± 1 °C in gaseous environment of 5 ± 1% carbon dioxide. At the end of the 48 ± 1 h incubation medium with test item / positive control was removed and cells were incubated for 4 h with 20 µl of MTT 5 mg/ml solution. After 4 h incubation formazan crystals formed by mitochondrial reduction of MTT was solubilized by adding 150 µl of DMSO. Absorbance was read at 570 nm after 10 min incubation with vortexing. Data Analysis: A decrease in the number of living cells results in a decrease in the metabolic activity in the sample. This decrease directly correlates to the amount of formazan formed as monitored by optical density at 570 nm. Percent Viability will be calculated using the below formula and shown Table 3 and 4. In-vitro COX Inhibition Assay: The ability of Berberine to inhibit ovine COX-1 and COX-2 was determined using an enzyme immunoassay (EIA) kit (catalog no. 560101; Cayman Chemical Co., Ann Arbor, MI, USA). COX catalyzes the first step in the biosynthesis of AA to PGH2. PGF2α, produced from PGH2 by reduction with stannous chloride, was measured by EIA (ACE™ competitive EIA, Cayman Chemical, Ann Arbor, MI, USA). Briefly, to a series of supplied reaction buffer solutions [960 μL 0.1 M Tris-HCl (pH 8.0) containing 5 mM EDTA and 2 mM phenol] with either COX-1 or COX-2 (10 μL) enzyme in the presence of heme (10 μL), 10 μL of various concentrations of test drug solutions (1, 10, or 100μM in a final volume of 1 μL) were added. These solutions were incubated for 5 min at 37 °C and subsequently 10 μL AA solutions (100 μL) was added. The COX reaction was stopped by the addition of 50 μL 1 M HCl after 2 min. Then 100μL of stannous chloride was added to produce PGF2α, which was measured by EIA. This assay is based on the competition between PGs and a PG- acetylcholinesterase conjugate (PG tracer) for a limited amount of PG antiserum. The amount of PG tracer that is able to bind to the PG antiserum is inversely proportional to the concentration of PGs in the wells since the concentration of the PG tracer is held at a constant while the concentration of PGs varies. The specific antiserum-PG complex bound to a mouse anti-rabbit IgG that had been previously attached to the well. The plate was washed to remove any unbound reagents and 200 μL Ellman’s reagents, which contain the substrate to acetylcholine esterase, were added to the well. The product of this enzymatic reaction generates a distinct yellow color that absorbs at 406 nm. The intensity of this color, determined by spectrophotometry, is proportional to the amount of PG tracer bound to the well, which is inversely proportional to the amount of PGs present in the well during the incubation. Percent inhibition was calculated by the comparison of the compounds treated to the various control incubations Table 5. Measurement of PGE2: HepG2 cells were plated at a density of 2.5 × 105/ml cells in a 24-well plate with 1 ml of culture medium per well and cultured overnight. The cells were pre-incubated for 2 h with various doses of Berberine and stimulated for 24 h with 100 ng/ml LPS. The cell culture supernatants were collected immediately following treatment and centrifuged at 1,000 × g for 15 min to remove the particulate matter. PGE2 was determined using an enzyme immunoassay (EIA) kit (catalog no. ADI-900-001, Enzo Life Sciences, Switzerland). The medium and PGE2 EIA conjugate was added to a 96-well plate pre-coated with goat anti-mouse IgG and left to react for 2 h, followed by a final wash to remove any unbound antibody-enzyme reagent. A substrate solution was added and the intensity of the color produced was measured at 405 nm (correction wavelength set at 570-590 nm). Principle: Prostaglandin E2 (PGE2) is a primary product of arachidonic metabolism and is synthesized via the Cyclooxygenases (COX) and prostaglandin synthase pathways. PGE2 production is a commonly used method for the detection of COX-1 and COX-2 modulation and prostaglandin synthases. The HTRF® PGE2 assay is a highly sensitive method for quantifying PGE2 either in cell supernatants or directly in the presence of whole cells. Our reagents have simplified protocols requiring only two reagent additions. These protocols are easily miniaturized and amenable to automation and HTS. Lysis Buffer Preparation: Hepes 25 mM, 1% sodium deoxycholate, 0.1% SDS, NaCl 0.5 M, edetic acid 5 mM, NaF 50 mM, sodium vanadate 0.1 mM, phenylmethylsulfonyl fluoride (PMSF) 1mM, leupeptin 0.1 g/L, and 1.5% Triton X-100 pH 7.8. The cultured were lysed using lysis buffer at 4 °C with sonication. The lysates were centrifuged at 20000 RPM for 15 min and the concentration of the protein was determined with the Coomassie brilliant blue reagent. SDS PAGE: Tris-HCl 42 mM, 10% glycerol, 2.3% SDS, 5% 2-mercaptoethanol and 0.002% bromo-phenol blue loading buffer was then added to each lysate, which was subsequently boiled for 3 min and then electrophoresed on a SDS-polyacrylamide gel. Proteins were transferred to nitrocellulose and incubated sequentially with antibodies and then with peroxidase-conjugated secondary antibodies in the second reaction. Detection was performed with enhanced chemiluminescence reagent. The results on Western blot analysis shown in Fig. 1 represented the average of three individual experiments. RESULTS: Metabolic activity can be evaluated by measuring the activity of a mitochondrial enzyme succinate dehydrogenase using MTT test. MTT is designed for the quantification of cytotoxic index in cell population using 96 well plate format. This test is widely used in the in-vitro evaluation of the cytotoxic potency of drugs. In the present study we applied the MTT test to evaluate the potency of berberine hydrochloride on HEPG2 cancer cell lines in an in vitro cell-based assay. Berberine was found to have inhibitory activity of 85% at concentration of 0.5 mg/ml and EC50 value of 0.214 mg/ml. 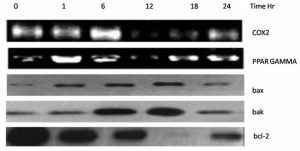 We determined the levels of COX-2 in lysates of cells from the various treatment groups using western blot analysis. As shown in Fig. 1 and Table 5, treatment of HEPG2 cells with berberine hydrochloride reduced the levels of COX-2 expression in a concentration-dependent manner as compared with the expression in untreated controls and increased PPAR Gamma levels. As the COX-2 metabolite, PGE2 has been implicated in COX-2-mediated effects; we determined the levels of PGE2 in the berberine-treated cells. Our results revealed that treatment with berberine hydro-chloride for 24 h resulted in significant inhibition of PGE2 production in a dose-dependent manner Graph 2 21 - 75%, P, 0.01-0.001, suggesting that berberine induced reduction in PGE2 production is associated with an inhibitory effect of the berberine on COX-2 in these cells. CONCLUSION: Berberine hydrochloride has shown to induce apoptosis by activation of PPAR Ƴ (Gamma) via PEG2 (prostaglandin2) regulation pathway and COX2 inhibition in HEPG2 liver cancer cell lines. Berberine has shown PPAR Gamma activation and COX2 inhibition via PGE2 regulation and caused apoptosis by down regulating antiapoptotic protein bcl-2 and upregulating bax and bak proteins. From the studies it is concluded that berberine hydrochloride can be a potential chemotherapeutic agent to treat hepatocellular carcinoma. ACKNOWLEDGEMENT: Thanks for Vimta Laboratories Hyderabad for providing us facility to test. Chistyakov DV, Aleshin SE, Astakhova AA, Sergeeva MG and Reiser G: Regulation of per-oxisome proliferator-activated receptors PPAR a and ? of rat brain astrocytes in the course of activation by toll-like receptor agonists, J. Neurochem 2015; 134(1): 113-124. DOI: 10.1111/jnc.13101. Sergeeva MG, Aleshin SE, Grabeklis S and Reiser G: PPAR activation has dichotomous control on the expression levels of cytosolic and secretory phospholipase A2 in astrocytes; inhibition in naive, untreated cells and enhancement in LPS-stimulated cells, J. Neurochem. 2010; 115: 399-410. Gupta A, Kumar A and Kulkarni SK: Targeting oxidative stress, mitochondrial dysfunction and neuroinflammatory signaling by selective cyclooxygenase COX-2 inhibitors mitigates MPTP-induced neurotoxici-ty in mice, Prog. Neuropsychopharmacol. Biol. Psychiatr. 2011; 35: 974-981. Trepanier CH and Milgram NW: Neuroinflammation in Alzheimer’s disease: are NSAIDs and selective COX-2 inhibitors the next line of therapy? J. Alzheimer’s Dis. 2010; 21: 1089-1099. Balasubramanian R, Gerrard J, Dalla Man C, Firbank MJ, Lane A and English PT: Combination peroxisome proliferator-activated receptor gamma and alpha agonist treatment in Type 2 diabetes prevents the beneficial pioglitazone effect on liver fat content. Diabet Med. 2010; 27: 150-156. Blobaum AL and Marnett LJ: Structural and functional basis of Cyclooxygenases inhibition. J Med Chem 2007; 50: 1425-1441. Ban JO, Kwak DH, Oh JH, Park EJ, Cho MC and Song HS: Suppression of NF-kappaB and GSK-3beta is involved in colon cancer cell growth inhibition by the PPAR agonist troglitazone. Chem Biol Interact. 2010; 188: 75-85. EASL-EORTC clinical practice guidelines. management of hepatocellular carcinoma. J Hepatol. 2012; 56: 908-43. Sumie S, Kawaguchi T, Kawaguchi A, Kuromatsu R, Nakano M, Satani M, Yamada S, Okamura S, Yonezawa Y, Kakuma T, Torimura T and Sata M: Effect of pioglitazone on outcome following curative treatment for hepatocellular carcinoma in patients with hepatitis C virus infection: a prospective study. Mol Clin Oncol. 2015; 3: 115-20. Kudo M: Immune checkpoint inhibition in hepatocellular carcinoma: basics and ongoing clinical trials. Oncology. 2017; 92(S1): 50-62. Chu TH, Chan HH, Kuo HM, Liu LF, Hu TH, Sun CK, Kung ML, Lin SW, Wang EM, Ma YL, Cheng KH, Lai KH and Wen ZH: Celecoxib suppresses hepatoma stemness and progression by up-regulating PTEN. Oncotarget. 2014; 5: 1475-90. Cao LQ, Shao ZL, Liang HH, Zhang DW, Yang XW, Jiang XF and Xue P: Activation of peroxisome proliferator-activated receptor-γ PPARγ inhibits hepatoma cell growth via downregulation of SEPT2 expression. Cancer Lett. 2015; 359: 127-35. Katiyar SK, Meeran SM, Katiyar N and Akhtar S: p53 cooperates berberine-induced growth inhibition and apoptosis of non-small cell human lung cancer cells in-vitro and tumor xenograft growth in-vivo. Mol Carcinog 2009; 48: 24-37. Mantena SK, Sharma SD and Katiyar SK: Berberine inhibits growth, induces G1 arrest and apoptosis in human epidermoid carcinoma A431 cells by regulating Cdki-Cdk-cyclin cascade, disruption of mitochondrial membrane potential and cleavage of caspase 3 and PARP. Carcinogenesis 2006; 27: 2018-2027. Ristima¨ ki A, Honkanen N, Ja¨nka¨ la¨ H, Sipponen P and Ha¨ rko¨ nen M: Cancer Res., 1997; 57: 1276-1280. Hazra S, Peebles KA, Sharma S, Mao JT and Dubinett SM: The role of PPARγ in the cyclooxygenase pathway in lung cancer. PPAR Research 2008; Article ID 790568, 7. Donnini S, Finetti F, Terzuoli E, Giachetti A, Iñiguez MA, Hanaka H, Fresno M, Rådmark O and Ziche M: EGFR signaling upregulates expression of microsomal prostaglandin E synthase-1 in cancer cells leading to enhanced tumorigenicity. Oncogene. 2012; 31: 3457-3466. Balakrishna A and Manikyam HK: Evaluation of Synergetic Anticancer Activity of Berberine and Curcumin on Different Models of A549, Hep-G2, MCF-7, Jurkat, and K562 Cell Lines, BioMed Research International Volume 2015, Article ID 354614. Manikyam HK, Ramesh C, Yadav P and Kenttar A: Berberine chloride induced apoptosis in HepG2 cancer cell line via PPAR gamma activation and COX2 inhibition by regulating prostaglandin E2 (PGE2) signalling pathway. Int J Pharm Sci & Res 2018; 9(11): 4723-28. doi: 10.13040/IJPSR.0975-8232.9(11).4723-28. Authors Address: Department of Chemistry, North East Frontier Technical University, West Siang, Arunachal Pradesh, India.